Fancy wobbling your way to fitness? 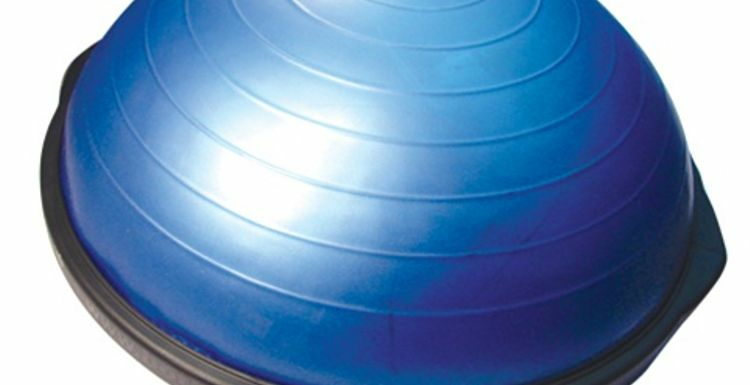 The bosu ball can bump up your fitness levels in just a few sessions. Imagine an exercise ball that’s been cut in half with a flat platform on the bottom. That’s a BOSU ball, which stands for “both sides up”. They are becoming a hot fitness trend, with plenty of Instagram posts of celebrities using them. You can try on out at your local gym and it’s a great addition to any home gym. The flat platform on one side and rubber dome on the other adds instability to your workouts, forcing your muscles to work harder to remain steady. Plank. Place the blue side on the floor and grip the edges of the flat platform. Straighten your legs out behind you and hold a straight-arm plank for 30 seconds. This will challenge your balance and engage muscles throughout your entire upper body. Push-up. Place the blue side on the floor, grip the sides of the flat platform. In standard push-up position, lower your chest towards the ball. Do 5 reps. This is an advanced move which targets additional muscles into the exercise. Expect to shake initially as your stabilizer muscles adjust to support you, which will strengthen after a few sessions. Squat. Place the flat side of the ball on the floor and stand on the blue dome, feet hip-width apart. Lower down into a squat, push back up and repeat 10 times. The unstable surface engages more muscles, including the core. Increasing the muscle mass in your large leg muscles will help increase your metabolism, aiding weight loss. If you want something that transforms your core training, this is it. You can perform all sorts of exercises on a BOSU ball, from core training and dumbbell exercises to upper body and cardio work. Ultimately you get a more intense workout per minutes spent, which is a major part of its appeal. BOSU balls require a good sense of body awareness, which improves your balance. You will also learn to control your body movements, posture and positioning. Surprisingly, BOSU balls also help improve your flexibility. Drawing yourself over the ball and relaxing your muscles enables your muscles to stretch in a way that they can’t with traditional exercises. Ah now I know what I saw at a gym the other week. i thought it was some kind of fun bouncing thing but that makes more sense now. What a great idea, I would love to try one.